The discovery of a magnetic field oriented to the left could provide scientists with clue to explain a long-standing mystery, the dominance of matter over antimatter in the early universe. In theory, we should not exist — at leats not in the same way as the universe today — and that because of antimatter. For each particle of matter there is partner particle called antiparticle which have many of the same particle’ characteristics but with opposite charge and when the two particles meets they destroy each other completely releasing huge amount of energy. When our universe was born, there should be as much matter as antimatter. However, it is clear that we live in a universe dominated by matter and we have not yet discovered high concentrations of antimatter which should be visible if both existed in equal numbers. This ‘fairy’ coexistence between matter and antimatter is considered one of the greatest unsolved mysteries of science. But now, a team of scientists led by Gianluca Sarri has managed to create an electron-positron plasma (never been produced before in the laboratory). Such plasma would have existed in the Big Bang’s first moments. We used an ultra-high vacuum chamber with an air pressure corresponding to a hundredth of a millionth of our atmosphere to shoot an ultra-short and intense laser pulse (hundred billions of billions more intense that sunlight on the Earth surface) onto a nitrogen gas. This stripped off the gas’ electrons and accelerated them to a speed extremely close to that of light. Explain Dr. Sarri in a new release. 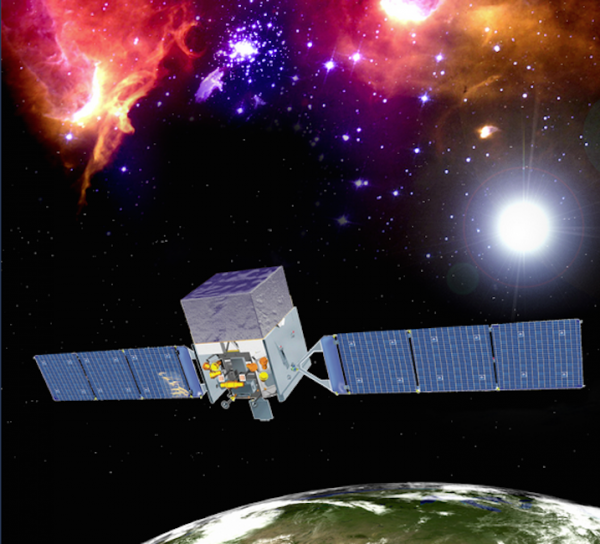 An artist’s illustration of Fermi Gamma ray Space Telescope. ©NASA. So, what happened to the antimatter? This mystery puzzled physicists for decades. Recent experiments in particle accelerators have shown that even if matter and antimatter were created in equal amounts its turns out matter ‘won the race’ everytime. Of course, explanations for this ‘anomaly’ have been advanced. For example, in February, UCLA’ physicists hypothesized that the Higgs field — which is accompanied by the famous fundamental particle called Higgs boson and is responsible for the fact that particles have mass — could have briefly differentiated the masses of particles from their antiparticles along the way. This difference in mass could have made matter particles more likely to form than antimatter in universe’ early days. It is a nice idea that deserves further study. Said then physicist Kari Enqvist. There is a very high probability for the Higgs field to have a high initial value after inflation. Now, scientists from US and Japanese universities offered a new ‘solution’ with their work published in Monthly Notices of the Royal Astronomical Society. Based on the data collected by NASA’s Fermi Gamma ray Space Telescope, the researchers have identified a “twisted” gamma rays which are evidence of a helical magnetic fields that has existed in the universe since less than a second after the Big Bang occurred. The gamma rays, sensitive to the effect of a magnetic field, carried a spiral pattern imprint from the field. Analysis of the imprint and its properties showed the field is predominately left-handed. The left-hand orientation is evidence of the overwhelming production of mat-ter. Vachaspati and his team say that anti-mat-ter would have produced a right-hand orientation. What we found is consistent with them all being left-handed. But we can’t be sure.” He says there’s less than a one per cent chance that what they see in the Fermi data happened by chance. “That’s being conservative.. They also found that the twists in the field are a bit bigger than they predicted. So there is some mystery there. More data from Fermi, which is expected this year, will help narrow down the odds. The Magnetic fields could have been caused in other ways, including from inflation. What’s more, for CP-violation to provide enough matter in the universe you usually need “new physics” – stuff beyond the standard model of particle physics – which hasn’t been confirmed experimentally yet. But it is a very interesting idea. Bottom line: Launched in 2008, the Fermi Gamma-ray Space Telescope observes gamma rays from very distant sources, such as the universe’s supermassive black holes.